With increased trace clock speeds comes an increased risk of signal misalignment when parallel trace pins are sampled. 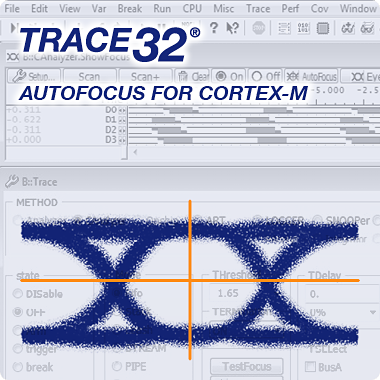 The TRACE32 AutoFocus technology not only detects the trace port clock frequency but can also adjust the optimum sampling points of each pin to negate any alignment issues in the timing of the data signals. The points where each signal contains valid data, or data eyes, for each pin can be displayed in the TRACE32 PowerView software. Detailed information about jitters, rising and falling edges is also displayed and users are provided with the capability of manually adjusting the sampling point of each signal. Once configured, these sampling points may be saved and recalled for future use of the tools on this target. With SWO trace, there is only a single data line. This line is separated into eight virtual channels, one for each bit of a transmitted byte.